Today, United Kingdom residents head to the polls in a very close race in which the U.K.’s power players will be determined, with smaller parties expected to make big gains. But what, if anything, about the election could be gleaned from Twitter? A new Pew Research Center analysis of the months leading up to election day finds that four of the six parties received more negative commentary than positive. Just one party studied – the Greens – enjoyed mostly positive comments, according to an analysis of more than 13 million English-language tweets between March 30 and May 3. The balance of sentiment only changed slightly in the final full week leading up to the election. Both the Conservative Party and the Labour Party, which have dominated the political scene for over a century, are competing to secure the majority in the House of Commons. But smaller parties that have gained public support are also likely to gain seats. The Conservative and Labour parties both received more negative statements than positive on Twitter. They also drew the most attention among the six. There were roughly 5 million tweets about the Labour Party: 48% of the mentions carried a negative tone, 27% positive and 26% neutral. The sentiment around the incumbent Conservative Party (discussed in 3.5 million tweets) was even more negative – 72% of the assertions were negative, compared with just 10% that were positive and 18% that were neutral. The Scottish National Party (SNP), which supported an unsuccessful effort last year for Scotland to gain more autonomy from the U.K., might become the third-biggest party in the House of Commons after these elections. On Twitter, it received strong attention, with about 3 million tweets, just behind the governing party. In contrast to the Conservatives, Labour, and the Liberal Democrats, the sentiment on Twitter about the SNP was more down the middle – 36% positive, 35% negative and 29% neutral. The Liberal Democrats, who are currently in a governing coalition with the Tories, received more negative than positive assertions: 49% negative to 8% positive and 43% neutral. However, these views reflect only a smaller part of conversation, with about 1 million posts. There was also lower volume of tweets about UKIP – which favors the country leaving the European Union and tighter restrictions on immigration – though it garnered less attention than the Conservative Party, the Labour Party and the SNP. Nearly half of the statements (47%) were negative, compared with 19% that were positive and 34% that were neutral. But their lower attention overall stands in sharp contrast to the attention received during the last two weeks of the EU elections a year ago. Last year, from May 1 to 14, UKIP generated 607,447 tweets, which was more than for the Tories, the Labour Party and the Liberal Democrats combined. The only party studied that received more positive remarks than negative was the Green Party, which focuses on environmental issues. More than half of the Twitter assertions (57%) were positive, while 27% were negative and just 16% neutral. But the conversation about this group was relatively small, with 1.6 million tweets. Over the final week leading up to the election (April 27-May 3, 2015), the general trend of negative remarks toward the parties saw only minimal change. The only party to see much of a shift was UKIP, for which the tone was more evenly balanced; 28% of the Twitter assertions were negative, 29% positive and 43% neutral. Pew Research also analyzed the official Twitter accounts of the six parties and found that they all have an active presence. 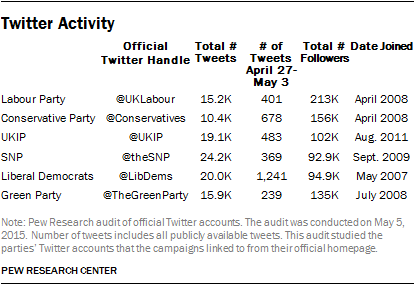 The Green Party tweeted the least between April 27 and May 3, generating an average of 34 tweets per day. And while the Twitter conversation about the Liberal Democrats was limited, their official Twitter account was the most active in the same time period. The @LibDems account generated more than 1,200 tweets, nearly twice the number published by the Conservative Party’s account. Note: See our full methodology on the Twitter analysis here. The six parties studied here were all referenced in at least 1 million tweets over the time period studied. There are smaller regional parties but none received even half as many tweets (Sinn Fein: 57,908; Plaid Cymru: 316,853; DUP: 84,874; SDLP: 10,905).